Craig James went to Southern Methodist University back in the 1980s and was the running mate to Hall of Famer Eric Dickerson where they formed the “Pony Express”. He’d be drafted by the Washington Federals of the USFL and play there from 1983-1984 rushing for 823 yards and 4 touchdowns but would be released unceremoniously as the Federals were financially insolvent. Craig would sign with the New England Patriots in 1984, (who drafted him shrewdly in the 8th round in 1983,) where he’d go on to be named offensive player of the year in 1985 going to both the Pro Bowl and the Super Bowl that season; However, he’d be dominated by the Chicago Bears holding him to 1 yard on 5 carries. James would earn the nickname in some circles of “The Last Great White Hope” being the last white running back to run for 1000 yards (until that streak was broken in 2010 by Peyton Hillis). 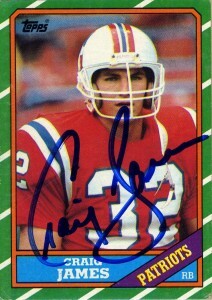 James notably played runningback in 1984 and then fullback from 1985 on to his quiet retirement in 1988 due to injuries. James’ career since football has been just as busy. Despite the dissolution of the SWC that he set conference records in, James’ legacy has grown a substantial amount. He has been able to parlay his personality and playing career into broadcasting where he remains to this day handling college and pro games on the radio and television.